ENTER TO WIN: Our Sparrow Handbag Giveaway! You’ve decorated your baby’s nursery with eco-friendly bedding and decor, and filled it with green toys, cloth diapers, BPA-free bottles and handmade, wooden teethers. Everything touching your little one’s world is sustainably designed… but have you chosen an eco-savvy diaper bag for yourself, to tote all of your babe’s gear to and fro? We’ve got an amazing bag to give away to one lucky mama: the extra large, roomy, vegan, organic Hakima Handbag (worth $104) by Sparrow Handbags! Fully lined with black hemp/cotton fabric, and made with 100% SKAL certified organic cotton twill, the beauty of this bag is that it’s not only “green,” it’s also versatile, sleek and stylish. You’ll look like the eco fashion maven you are while carrying around all of your baby’s gear, and you can continue to sport this bag long after your tot is out of the diaper stage. 1) Sign up for our newsletter. 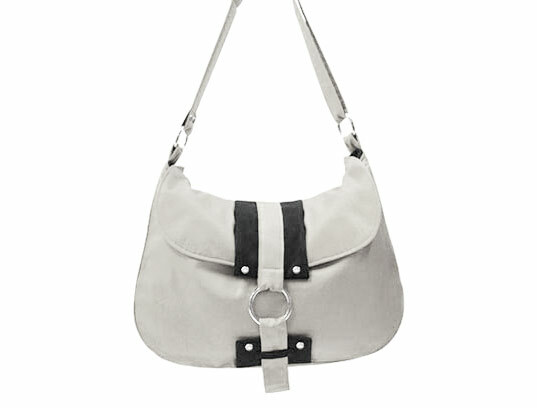 2) Leave a comment on this post telling us why you want to win this stylish, sustainably designed Hakima Bag, worth $104! I just signed up for the newsletter. I'd like this bag because it would be a great combo diaper bag/purse for when I was just running out for a short time and didn't need to carry both. I'm signed up for the newsletter. What a great bag, no way does it look like a diaper bag..it looks like a designer purse! I love that long after baby no longer needs it, I'll be able to tote all my mommy things inside in style. Sometimes it's hard to bridge sustainability and good design techniques. Often times you find amazing clothing, bags, hats, etc that has to be one or the other...Why can't they be both? The answer is there is no answer, they should be! As a co-founder of a permaculture sustainable farm movement in austin, but also someone who loves good design, simple elegant lines and fashion it's often hard for me to bridge those worlds. As soon as you say you're sustainable people expect you to be tromping around in burlap sacks smelling of patchouli even after you've passed by. So for the same question I ask about clothes and the like, I ask about people...Why can't you be sustainable as well as having great fashion sense. And the answer is...You can! Especially with this gorgeous bag. I'd love to win this bag because it is really cute and I think it is wonderful that something so stylish is also eco-friendly! I don't own a gray bag but I'd like to! I would like to win this bag because.....it's not a diaper bag or a huge "mommy" bag AND it's eco-friendly! I'm so ready for one! Thanks for the giveaway! Hey! Just signed up for the newslettter as well. I would love this bag for my baby due late April. (We are crossing our fingers and hoping for an Earth Day baby) My husband and I would love this eco-friendly bag cause we are planning on teaching our daughter from the get-go on earth friendly living and that being green isn't about compromising your style, and style doesn't have to compromise your ethics. So besides using cloth and g-diapers, making our own baby food, using second-hand items....there are other ways to raise your child in an sustainable environment. This bag would be great to incorporate those ideals, and as a director of a community service, I can also show others in my town that you can be a stylish and green mama! I love this site so much and just discovered it a couple of weeks ago. Everything you guys post up is always so amazingly eco-conscious and its always a pleasure procrastinating from doing my work to check out what you guys are sharing with us. These manufacturers have such adorable and stylish designs that are handmade in Canada, made of sustainable and environmentally friendly material...what more could you ask for? It's so great that you guys are giving one away and I'm just grateful for taking part of this generous opportunity you are offering. Love you guys!!! I would love this bag. So stylish and compact. I currently have an eco-friendly diaper bag, but it's boxy and bulky and not very cute at all. Throw a few cloth diapers in there and I'd be ready to go! I haven't bought myself a purse in a few years and I am actually using one I borrowed from my sister. I am looking forward to finally retiring the diaper bag and am on the hunt for a purse. An adorable bag very fashionable and love that it is made from organic cotton! I'm subscribed to the newsletter. I would love to win this diaper bag. It is a great size and will match EVERYTHING! I would love to win this diaperbag. It is the perfect size and will go with EVERYTHING! I subscribed. I would love to win because a juice bottle broke and spilled throughout my present diaper bag, ruining it. I would love a new one, and it's so lovely. O would love to win because my friend needs a new diaper bag and would love this one. I subscribed. I would love this bag because there are days that I definitely don't want to lug my huge mom-looking diaper bag around but still need something bigger than a purse to hold my daughters' things in... plus it's eco-savvy, how great! Thanks! I would love this because after the diaper bag stage, it can still be a great purse! It's gorgeous! I love it! I would love to win this bag! I am just coming out of the "new baby fog" (6 weeks post-partum) and have vowed to start making moe of an effort tp look like a real person again as opposed to a sloppy sleep deprived zombie -haha.. This would be such a fun addition to my new self. I would love to win this because my current UNsustainable diaper bag is ready to be replaced! I am going to be a Grandma again. I would love to have a new bag to tote all of my new granddaughters things around. It's hard to find a great, vegan, high quality and beautiful bag! I think that's the one I've been looking for! Thanks for the great giveaway! I subscribed to the newsletter! The Sparrow handbag is lovely. I make sure my daughter comes into contact with eco-friendly items, but I have to remember to take care of Mama too! I would love to carry something sustainable that is also cute too! Hooray! I LOVE this bag! I desperately need a new diaper bag! I love how this bag looks just like a designer purse, not a diaper bag! I am always excited about acquiring a new bag to carry all the kids' stuff. Thanks for the contest. I subscribed. I have been looking for a new bag but have not been able to find something I like that is also functional. This bag would be both of those and eco-friendly so perfect. I signed up for the newletter. You are correct, I did get the eco-friendly items for the babies room and clothes. But, I failed to think about the diaper bag being eco-friendly. In the bag is where the bottles, diapers, toys, etc go. I would like to have this stylish hemp cloth lined bag for my babies item. I subscribed! I would love to win this bag because it's just beautiful, and it would be so much fun to have once my first little one makes his way into the world in May. I love that it's so very "green" and so very cool looking! :) Thanks so much for the giveaway! I think this bag is real cute and being a mom of 3(almost 4) unless I can win it I usually don't get it. I would love to win this bag cause its a cute bag and because I am a mom of 3 (almost 4) and if I don't win it I usually don't get it. What a wonderful vegan bag! I am so impressed. I signed yp for your newsletter . Great siteI am also entering for this fantastic giveaway. This bag is beautiful and the perfect colors. Its so roomy and I would love to own. You've decorated your baby's nursery with eco-friendly bedding and decor, and filled it with green toys, cloth diapers, BPA-free bottles and handmade, wooden teethers. Everything touching your little one's world is sustainably designed... but have you chosen an eco-savvy diaper bag for yourself, to tote all of your babe's gear to and fro?